For my birthday I received Barnes & Noble gift cards. Rather than spending them on some DVD/Blu Ray or some newfangled book, I decided to purchase a boxed set of C. S. Lewis' classic works. True, the set comes with a couple works I have already read & love (Mere Christianity & Screwtape Letters), but it also contains works that I have been longing to read for a while & never got around to. This title is the first that I have had a chance to dive into since purchase. The author is C. S. Lewis, who is a credentialed literary critic & masterful writer. I have probably not done his merits justice, but suffice it to say that I cannot give him any less than a 5 out of 5 for technical merit. It feels wrong for someone of my non-stature to critique his pedigree. Yet, my two cents stand. He brilliantly weaves humor into a book whose subject is grief. He is a master of illustration--making the abstract appear concrete as ever. Read Lewis for Theology. Read Lewis for pleasure. A Grief Observed is a short piece, even by C. S. Lewis' standards. His works are always marked by their brevity. My edition consisted of 79 wide-margin pages & 1.5 spacing between lines. I was able to read it in a day & a half. You should read it too. Lewis strikes a vulnerable tone in this book which is markedly different than the other works I have read from him. He is not the scientist, peering at his subject through a cold microscope. 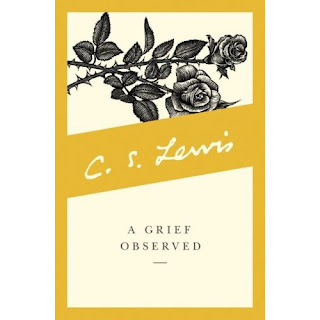 Lewis is, literally, a widower who is at once analyzing & experiencing his own grief at the loss of his dear wife. I came away from this reading with a new perspective on both marriage & God's testing. I expect that when I re-read this book after more life-experiences, I should realize some new aspects of this work that may be applicable then. Due to the nature of Lewis' grief, he delves a bit into marriage & the relationship between man & woman. He talks of the union as a process which naturally flows from Courtship to Marriage to Bereavement. About bereavement, he states that it is "a universal and integral part of our experience of love." If there was a time when you were not in wedlock, there will then be a time when you will no longer be in wedlock. You should enjoy & appreciate the unique aspects of the season you are currently living in, for it is not guaranteed to last. About God testing man; we talk a lot about God sending us a test. We cite passages about God never tempting us, but testing us for a time. We also talk about how tribulation will bring about patience, endurance & culminate in hope. However, we rarely ever flesh out what we mean. In one quote, C. S. Lewis accomplishes this: "God has not been trying an experiment on my faith or love in order to find out their quality. He knew it already. It was I who didn't." With that we realize that God sends us tests not that He may grade us, but that we may grade ourselves! We find, like his illustration states, that we have been building a house of cards that is easy to flatten. The sooner we are flattened, the sooner we can rebuild on a better foundation.